As sweet as cinnamon: Friends! Thank you to everyone who sent well wishes and old remedies. We had our results back of the whooping cough test and it was all clear. not enough antibodies in our blood. after a childhood vaccination either. I did use the Vicks on the feet and it works for sure. helps the throat not feel so sore. and we both received them a few days later. And this is what Narelle sent to me. enormous box on my door step. F - Four things... fabric, buttons, lace and threads. R - Roses wrapping paper and cards. S - Scarf. Hand knitted and so so soft. Christmas ornament, and cinnamon tea bags. and FRIEND.You have blessed me so much. Glad you got such lovely gifts, you deserve them. You had a good swap too. Me and my partner had a great time emailing and we still do. So pleased you were all clear of the whooping cough. What a beautiful box of FRIENDS gifts. Gorgeous goodies both coming and going. Hope the health fairies are buzzing around busily too. Hola, Dawn! Me alegro muchísimo que Ud. y su familia estén bien y que Vick en sus pies haya funcionado! Cuídese mucho! Disfrute sus bellos regalos! Un fuerte abrazo! Dawn, I'm just off my blogging break and am sorry to see that you and your family have been ill. I'm glad that it wasn't Whooping Cough and hope that you are all on your way to better health now! I didn't know you had to be re-vaccinated for Whopping Cough as an adult either until last year when my doctor gave it to me along with my flu shot! 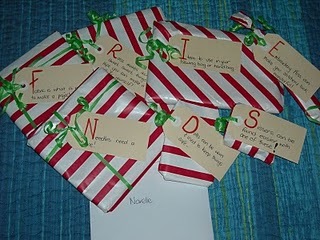 What lovely things you received in the FRIENDS swap! That was so much fun...I hope Khris does it again next year! I'm so glad it wasn't whooping cough, I didn't know you had to be re-vaccinated for it either until lately - they've been urging seniors to get it done now! I'm also very glad the Vick's worked. Now if I can just remember it for next time, lol. 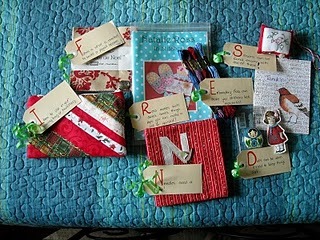 Your swap gifts are lovely, sent and received! wow Dawn you certainly have some lovely gifts and I`m sure your partner will love hers as well. cuantos regalos y que lindos! Muchisimas gracias por tu tiempo y por compartirlo! Espero que esten mejor de salud! So glad you're on the mend... I've been head down and didn't know you were sick... get better!! Whooping cough can be a shocker!! Oh yes you and Narelle did a fun swap. Narelle is a real sweet lady and does beautiful work. Enjoy using and playing with all your goodies! !